December started with a busy day for me. 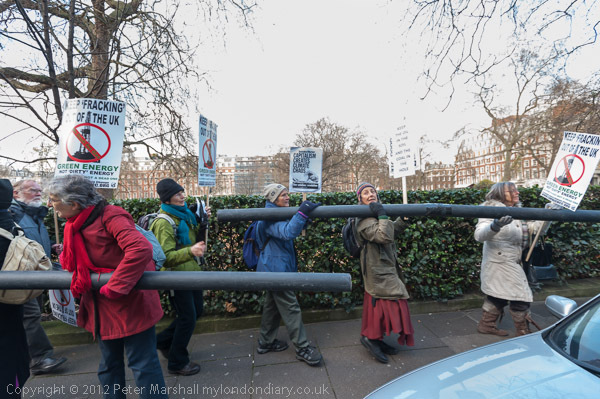 I’ve photographed most of the events organised by the Campaign against Climate Change (CCC) since it began, and their annual climate march at the start of December is a fixture in my diary, and I’d also been asked personally to take pictures. So I was there at the US Embassy in Grosvenor Square for the start at noon, though it was disappointingly rather a slow start. But eventually things got going with a decent number for a rally and then the construction of a pipeline along the whole length of the square – around 250 metres – held up by activists, running between the embassies of the USA (the world’s leading polluter and the country that has done most to prevent any effective action over climate change) and Canada (currently raising the stakes over dirty energy with its tar sands.) Like all too many media stunts which seem a good idea to those promoting them, it was virtually impossible to photograph in any sensible way – though I did my best. The picture above only included a single length of pipe, though I did manage one that worked with slightly more. 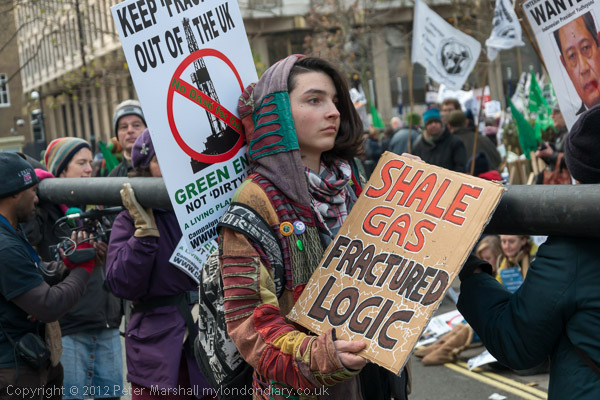 Finally, almost half an hour later than planned, the Climate March set off to Westminster, and I left them a few hundred yards down the road to go elsewhere. 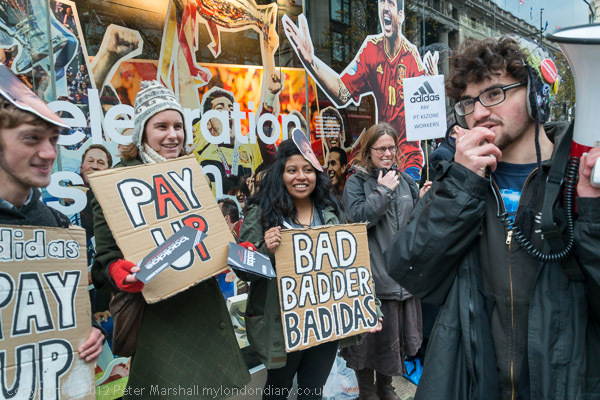 By now it was 2pm and I rushed up to Oxford St, where I found a rather smaller group of activists than I had expected starting to get ready to protest outside Adidas against the company’s failure to pay the redundancy due to some of those who had produced goods for them in Indonesia. It took a little while for them to get organised and for a few late-comers to arrive, but then it was fairly straightforward to take some pictures before jumping on a 73 bus for the short journey to South Street and the Egyptian Embassy to photograph the protest there against the decree by President Morsi. There were rather fewer there than I expected too, although the protest had been timed to start around 45 minutes earlier and the Egyptians sometimes seem to turn up rather late, so perhaps some were still on their way. A very small bonus was that this turned out to be two protests, with 4 or 5 supporters of the President holding their own protest against the main one – which was perhaps ten or twenty times larger. It wasn’t too easy to follow what was happening, as most of the placards and all of the speeches were not in English, and I had to spend a few minutes talking with protesters as well as taking pictures, but it wasn’t long before I had done enough and was on my way to Green Park station. But I was already late, and had to hurry, running a little to get there faster. 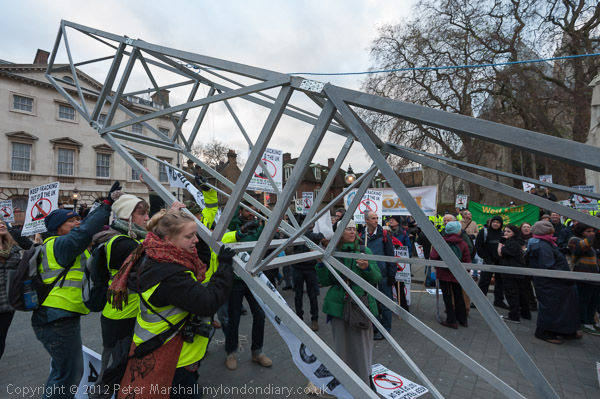 Getting off the train at Westminster, the marchers had beaten me, but I arrived at Old Palace Yard a little out of breath but in time to photograph the raising of the mock fracking derrick there. It was another stunt which sounded rather better as an idea than producing good pictures. I took quite a few, but couldn’t really get anything that worked well. 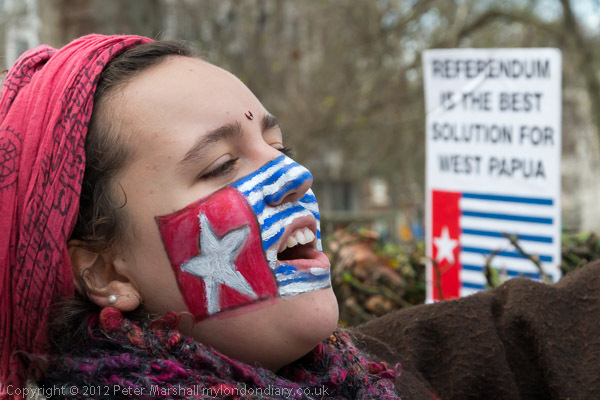 Earlier in the day there had also been another protest I’d photographed in Grosvenor Square, by West Papuans outside the Indonesian Embassy on the anniversary of their short-lived independence. It was a protest by a small group, but visually more effective than many with the flags and face-paint. As usual, I’d planned my day the previous night, working out which events I could cover and the timings and how I could get from one place to another. For once, despite some things running a little late, which made me change things a little, my plans more or less worked out. This entry was posted on Saturday, December 29th, 2012 at 01:00 pm and is filed under My Own Work, Photo Issues, Political Issues. You can follow any responses to this entry through the RSS 2.0 feed. You can leave a response, or trackback from your own site.